A snowstorm is no excuse to not play some soccer. The Western Maine Youth Soccer Association's indoor arena, built through a donation by Jordan Lumber and lots of volunteer work, allows kids to participate in rec league-style games in the middle of the winter. 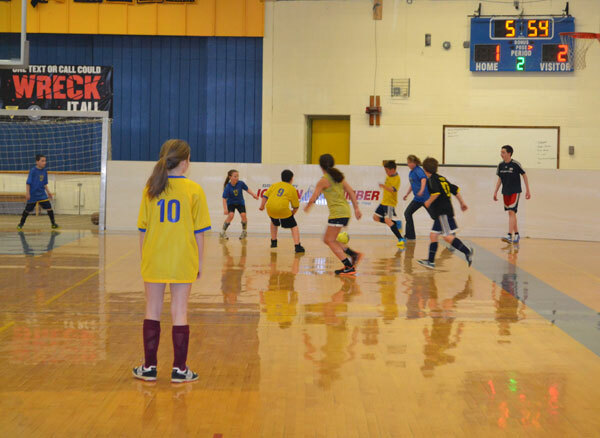 SALEM - Western Maine Youth Soccer Association indoor soccer returns this spring for athletes in grades 1 to 12. Register online or download a registration form to print. Registrations must be received by Feb. 24 at 9 p.m., without exception. The cost is $25 per player. Final Game on Sunday, March 24. Please have players ready to play at least 10 minutes prior to start time. Players must have appropriate athletic shoes. Shin guards are recommended for our programs, but are not required. Reversible WMYSA jerseys are available for purchase ($18) but are note required. Shirts from previous seasons may be used. Players without jerseys will be provided “pinnies” for games. Any questions can be directed to info@wmyouthsoccer.com or by calling the Division coordinator.